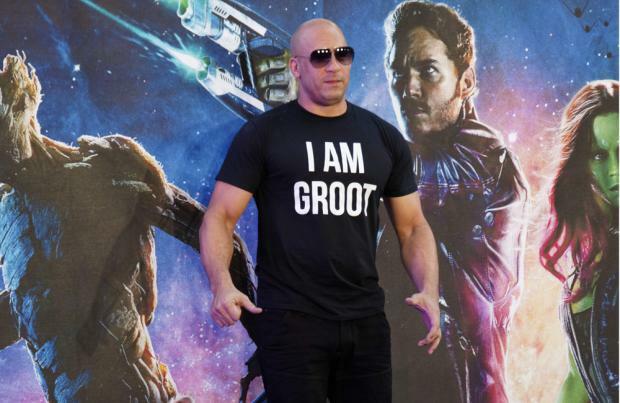 Vin Diesel was given a "secret script" for 'Guardians of the Galaxy'. The 49-year-old actor admits it was a "challenge" to voice Groot - who had a vocabulary of just three words - but he was given a lot of pointers in how to express the emotion the tree-like alien was trying to say. He said: "Groot is ­always challenging to play. As an audience what you hear is, 'I am Groot', but he is expressing himself and you have to try and convey what he intends to say and his emotions in those three words. "I actually had a secret script where I was told what Groot was trying to say. That made him a lot of fun to voice." He told the Daily Star on Sunday newspaper: "Korean was interesting. "It was cool though because in some countries people have only heard my characters with voice actors. It was good to know people would finally hear me." Though Groot sacrificed himself at the end of the 2014 movie, Vin is back again in 'Guardians of the Galaxy Vol. 2' voicing Baby Groot, and thinks the two characters are very different. He said: "Groot in the first movie was a college-level Groot. He might have had some growing up to do, but essentially he had the mind of a man. "After he sacrificed himself he has to start again. Baby Groot is naïve. He has to learn everything again." But the actor is hoping to return as Groot in 'Avengers: Infinity Wars' next year. He said: "I've never hidden my excitement at Groot and The Hulk ­going toe-to-toe in The Marvel Universe. "Obviously not Baby Groot. I talked to The Russo Brothers about that - so that might be something for fans to look out for!"